Spain boss Julen Lopetegui has announced his squad for their 2018 FIFA World Cup, with Chelsea’s Alvaro Morata being the key omission. 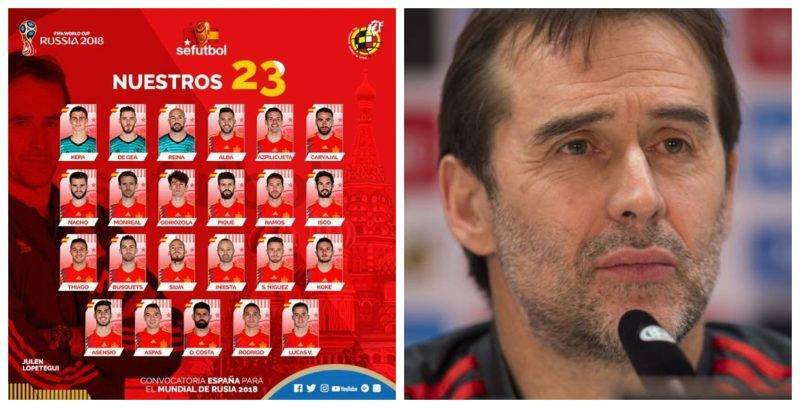 Spanish national team manager Julen Lopetegui unveiled his 23 man squad as “La Roja” look to emulate the heroics of 2010 South Africa World Cup-winning squad. Morata has been a consistent selection under Lopetegui and was La Roja’s joint-top scorer in qualifying with five goals. However, he has scored just one league goal in 2018 and has been dethroned by Diego Costa – who also netted five times in qualifying – Rodrigo, the Valencia attacker has scored 16 goals in 31 league games for Valencia and Iago Aspas of Celta Vigo based on their current form as Morata had a forgettable second half of the season with Chelsea. La Roja’s squad has moved on from Cesc Fábregas, Juan Mata, Pedro and many others and has also decided to go without the likes of Álvaro Morata, Marcos Alonso and Javi Martínez. Marcos Alonso could count himself unlucky to miss out despite scoring seven goals and earned two assists in 33 league games for Chelsea. United midfielder Herrera is considerably less of a surprise, having only received two caps for his country and last playing in a friendly against France over a year ago and did not flourish to his full potential as Manchester United finished another season trophyless. Other key players snubbed from the La Roja squad based on the recent form are Arsenal defender Hector Bellerin, Chelsea pair Pedro and Cesc Fabregas, and Bayern Munich midfielder Javi Martinez. Spain is grouped with Portugal, Morocco and Iran in Group B. Spain play warm-up matches against Switzerland on June 4 and Tunisia on June 9, ahead of the World Cup. Spanish players NOT selected for the World Cup squad..